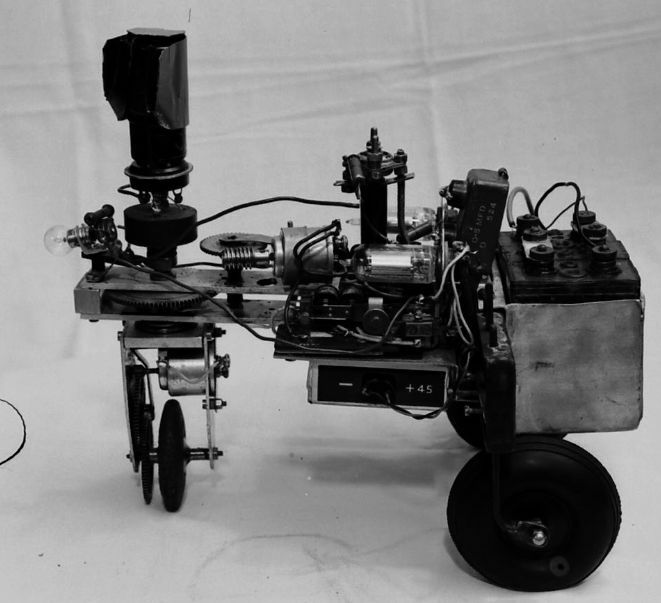 In 1948, inventor William Grey Walter brought to life Elsie and Elmer, two simple three-wheeled robots who seemed to have minds of their own. They could explore rooms, “dance” with each other, and even find their way back to their hutches to recharge when their batteries ran low. But Elsie and Elmer had no brains. Instead of a brain-like central processor, each had one visual sensor, a touch sensor and a set of simple on/off reflexes. But their simple reflex commands led to complicated behaviors, allowing them to act in a way that made them seem incredibly lifelike. So while an observer might be able to tell a story that attributes to them the kind of inner experience that comes from having a mind in order to explain their behaviour, in reality the robots themselves are far simpler. We often think of our brains as central processors, supercomputers that can crunch immense amounts of data at incredible speeds, which allow us to have (both inner and outer) experiences and to act in the world in complicated ways. And while in a certain sense this may be true, Elsie and Elmer remind us that you actually don’t need an inner experience or a complicated central processor to do complex things; even the simplest responses to a complex world can result in complicated behaviour (see Louise Barrett, Beyond the Brain, 42-48). While it’s difficult to debunk the brain-as-central-processor metaphor, it’s quite clumsy and doesn’t quite stand alone when we think about our actual experience. If someone throws a ball at our face, we catch it (I hope). If we have a hammer in our hand, we can just pound some nails. Sometimes we find ourselves just doing even very complicated things without stopping to process, think, or have any inner experience at all; there doesn’t always seem to be an intermediate “representation” phase between perceiving and acting. So in these cases, what actually happens might be something closer to Elsie and Elmer’s reflex commands. The common sense fact that, like William Grey Walter’s simple robots, we sometimes seem to be able to act without inner mental representation was an idea that Martin Heidegger, in his 1927 groundbreaking work Being and Time, used to flip the traditional Cartesian conception of the mind on its head, making for a radical redefinition of what it means to be human. The human person, Heidegger suggests, is not primarily a mind that thinks, as Descartes argued. It is a being that is always somewhere, hence his term for the human person Dasein (in English “being-there”). So for Heidegger we can’t exist apart from our being “there,” and the only way to think about ourselves is in terms of what we are like in this “there.” In other words, the only way to consider myself a “self” is by thinking about the way I am, have been, or could be in the world. There’s really no way to think about yourself in an abstract way without reference to the “there” where you act. For Heidegger, the bottom line is that a lot of the time we (literally) find ourselves just doing stuff, and we discover ourselves after already having acted. But, you might say, if I imagine, if I picture in my mind’s eye, a situation where someone kicks me in the shin, I know whether or not I am the type of person that will kick that person back without actually having to be there—my inner representation tells me about who I am. The thing is, though, thinking you are the kind of person that kicks back only makes sense in situations in the world. There is no abstract or “unworlded” way to think about whether or not you are that kind of person. So Heidegger locates what it means for a person to exist within a person’s activity in the world. In every case, when you think about yourself, you end up thinking about the world too. Heidegger’s reconception of what it means to be a person in the world means that we can no longer think about ourselves as only isolated inner minds, cordoned off from everyone and everything else. This means that our actions both affect the world of others and also help shape who we are in a very real way. If we humour Heidegger for a moment, we begin to see that our actions matter. They help make us who we are, and we are so tightly bound to others and to the world in which we find ourselves that just as we change others and our world, they change us. We can’t opt out. Elsie and Elmer are interesting because they couldn’t opt out either. Apart from things to run into and react to, their behaviour would be entirely predictable and uninteresting. But when you factor in an environment, complex and interesting behaviour can emerge. So maybe, just like Elsie and Elmer, the only reason why we’re interesting (even to ourselves) is not because we have really interesting internal mental lives; perhaps it’s because we have a world full of stuff and people to bump up against, an environment in which we can discover ourselves. We find ourselves always and already so entrenched in the stuff and the people we encounter that, when we really stop to think about it as Heidegger suggests that we do, we can’t separate where our world ends from where we begin. Like Elsie and Elmer, we’re already acting in and interacting with the environment long before we explain to ourselves what that means and who acting in that way makes us. Yet unlike Elsie and Elmer, we’re actually able to interpret and reflect upon our way of being in the world. But reflection always comes later. The difference between us (Dasein) and Grey Walter’s robots is that, unlike the robots (presumably), we have the capability to care about our activity in the world. If you are Dasein, you are able to tell yourself something about what your activity in the world means for who you are and are able to project who you think you are into future situations. Where Elsie and Elmer just react to the environment, Dasein can care about the fact that it is something that reacts. So though we can describe Elsie and Elmer’s “dance” behaviour as if they can care and reflect like Dasein can, it’s really just anthropomorphism, making them out to be more human-like than they are. But this human ability to care about and interpret our activity in the world requires careful consideration as we try to make sense of what it means to be the kind of thing a human person is. Regardless of whether or not we take cues from Heidegger’s philosophy, everything we do affects the people around us who, in turn, affect us. Perhaps, following the example of a couple of brainless robots and hearing the advice of a German philosopher, we can come to think of ourselves as deeply and inextricably connected to each other, bound together by the shared world in which we always find ourselves already involved. Special thanks to Reuben Hoggett from cyberneticzoo.com for his image collections and articles on Elsie and Elmer and for permission to use the above image of Elsie (see the source article from cyberneticzoo.com here). Your comments about Heidegger and self-hood are muddled. Dasein is about the existential nature of any being or self. It is primarily a way of stripping away or demystifying the sense of self we inherit from the Western tradition of metaphysics, particularly the Cartesian inauguration thereof (as you mentioned). 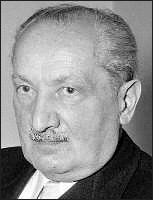 Heidegger's most persistent question or dilemma was: "How do we see anything outside of a pre-determined context" which privileges certain determinations particularly that of time or the present? Therefore Being or being(s) is/are indissociable from their foundational relationship to the present, originally deriving from what Heidegger called "temporalization," the process by which time and space are configured to a given present experience. With these things established, self-hood or being can be considered, as a sort of absurd, unknowable, singular entity. Heidegger was criticized by Derrida and Deleuze for not going far enough with this very genuine criticism of traditional metaphysics. Various thinkers of the "post-structuralist" grouping would say that "temporalization" is not a process and cannot be referred to positively. This is why Derrida writes the word "Being" crossed out as a tribute for and criticism of Heidegger. Heidegger's thinking that the state of Being is grounded when a need or a drive towards presence is established is still complacent to the Western metaphysical tradition's desire to determine the existence of an entity, to think of "Being" within our own enclosed sense of temporality in language and identity. Therefore, Being is crossed out and effaced, suggesting the impossibility of its expression while underlining the important criticism it demonstrates in the foundational, Heideggerian sense. This is why Derrida, Deleuze, Lyotard, Nancy, and many others use Freud's "drives" and Saussure's structured system of "Langue" in conjunction with Heidegger's language. They show the economic or systematic nature in time, language, desire, and context as being the only way to consider the status or nature of anything. No one aforementioned thinker is more or less valuable. They all provide different insight into this fundamental criticism, that which tries to "work as far backwards" from experience as possible, what Kant first initiated as "phenomenological" analysis. When opened up, this perspective can be extraordinarily useful in (re)considering all the human sciences. For example, anthropology and the relationship of evolution to consciousness -- also incredibly helpful in not creating ontological or theological determinations for the topography of the brain. If scientific research can consider this primary "phenomenological" suspension, much can be found out about the specific nature of temporalization or the slow, anthropocentric creation of consciousness, the conscious absorbing of a given surrounding and subsequent determination of "it" as "the present" or as truth, reality, etc. I think you're absolutely right that other thinkers are extremely important. This piece was focusing on Heidegger specifically, and I wasn't trying to make claims about what other philosophers might have to say here. But I agree that the insights of the other philosophers you mention are valuable and shouldn't be ignored. I might push back a bit on your explanation of Heidegger's guiding question. I think I'm with you on most of what you say. However, I might reframe your Heidegger's guiding question (at least in Being and Time) to be "what is the meaning of being?" From there he develops a theory about how Dasein emerges out of a pre-determined context and exercises individuality and freedom. Is that a fair clarification? I think in a way you're right that Heidegger tries to demystify the traditional way of thinking about selfhood. But I think by that we have to mean that he wants to do away with a certain more "mystical" explanation, not that he wants to reduce it to a simple explanation. His view of the self remains extremely nuanced and complex. It can still be very mystifying, but maybe differently mystifying than traditional metaphysics.